My Mom, Mornings and Dressing Up, Stories cover the first couple of weeks of another September. Two years ago this week, I hugged my Mom for the last time. For the last time, I told her I loved her and although she did not respond in words, in her eyes I saw that she loved me too. I talked about that day in my “Mom” blog, if you wanted to read it, but I can say now, that time does make things a little easier. Still, just about everyday I am reminded of her in one way or another and I love that I can still hear her laugh whenever I want to if I just close my eyes and think of her. A few years ago, I talked about me being “the hub” when it came to mornings in the Carr house and described the fact that if it was not for me, my girls would all sleep in ‘til noon. In that same post, I also talked about me making the girls lunches in the morning. One thought (among many I had this summer) was that I wanted the girls to take more control over their own morning rituals and included in this blue-sky notion, was making them making their own lunches. Jump to Tuesday of last week, the first day of school, and by some miracle that is exactly what happened and more. You see the girls must have been so excited about the return to academia, that they both got up before 6, got dressed, proceeded to make their own lunches (including healthy snacks) and they both packed their own back packs – all before my alarm even made a sound. So 8 days later, and out of the 7 mornings requiring lunches and a wake up call, they matched their day one feat exactly one more time. It could have been worse, I guess. For the most part, they did wake when I called them and they helped grab things I asked of them, and we where only late one day for school, and at that, it was only a minute or two. Maybe, just maybe, I set my sights a little high. For now, I will keep working on them getting up earlier and perhaps by December, they will be able to make their own lunches a couple days a week. I am sure I have talked about Julia and her incredible fashion sense before. This week, she got a chance to spend an old gift card she had kicking around in her purse at one of her favourite stores – Claire’s. Watching both girls, prance around the spinning display cases and sparkling jewelry something akin to a kid in a candy store, but Julia is the smart shopper. Taking after her Mom, always looking for the best deals and spending wisely. When I make faces, while watching this happen, I am sure I look frustrated, but the truth is, I find it quite entertaining. This trip, it was a hat that caught her eye, almost as fast as they all enter and a single glove that is reminiscent of the King of Pop, especially if worn together with the fedora and Beat It playing in the background. The one item purchased that kind of surprised me was of a bracelet. Remember a few weeks ago, talking about passing the truck on the 401 with the piggies in it? Why I laugh, and felt it worthy of a blog mention was the caption. Thick, black with bold white lettering and a dark red heart in the middle, proclaiming “I Love Bacon”! I am, for the most part, good with getting older. I accept the greying hair, forgetting things, and sounds and aches. I make getting up in the morning. I may be over dramatizing aging a bit, but I am only trying to illustrate a point that became a little more, painfully obvious to me today. My wife gets emails for some of best 50% off of the lowest price sales around, and for a great reason to get out of the house today, we dropped in on one such clearance outlet. The girls, willing oblige for the most part and enjoy the “shopping” part. What hit me like a ton of bricks was Jordyn coming out of the dressing room today, in a dress that looking like it could be for someone twice her age? It fit her. She looked wonderful, and maybe just a little too old, and in turn that made me feel old. Off to find some young hip clothes to shave a few years of my own. A Conversation in the car, Deep Jim and the year that was, the week 19 – year ending Carr blog is in the history book. Well, I am doing it. Doing what I hate to see myself, what episodic television does every season, when they want to cheap out on making a new show. You know, the lead characters sit around the set, and through a series of flash backs, recap all that happened in the last season in what some would call the “best of” show. Well, this is the best of Carr blog for the 2010 season. 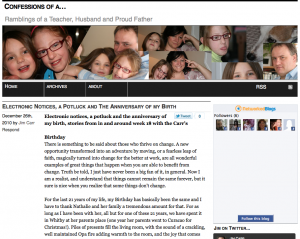 Over the last year, I posted my weekly recap of the life and times of the Carr family 39 times. If you are doing the math in your head, that would mean that I did miss 13 weeks in there, 8 or 9 of those fell in the summer. The one difference with my little flash back blog, is I will only include a short snippet of the original post, and provide a link to the complete one so that if you wish, you can go back and read the post in its entirety. My reasoning is, that I still want to write a little bit about the old post, and not hang my whole “episode” on flashbacks or rehashing of old words. A couple of times this last year (OK way more than a couple), I ventured into what I would call deep Jim, with some introspective bla bla about any number of topics. Starting with the first week of 2010, when I reflected on how much I had grown the last year. And by grow, I mean figuratively! So many of the closings come from conversations in the car. I guess we do spend a fair amount of time in the vehicle, on our way from one place to another, so here are a few references from this past year with the Carrs in the car. As for Jordyn, her observations are more drenched in sarcasm, and always delivered with impeccable timing and this post from this last November, was my favourite. 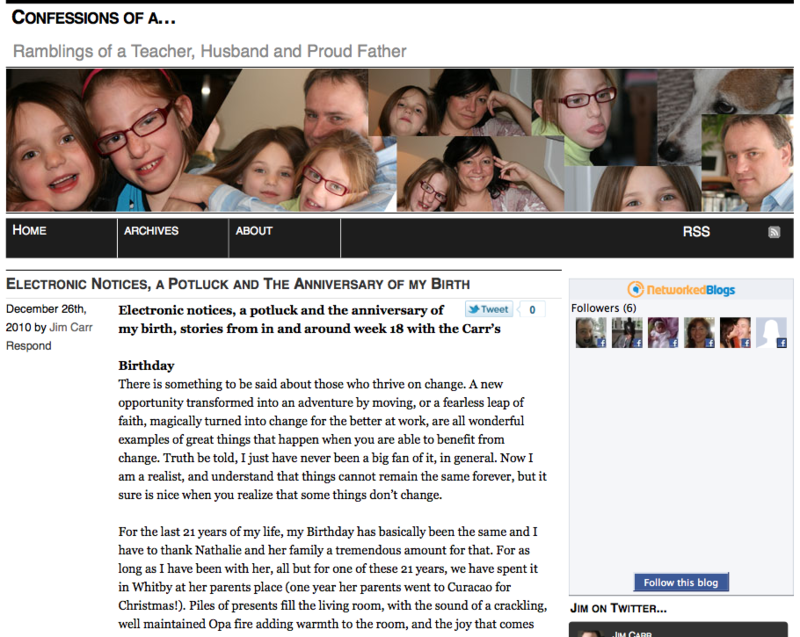 I talked a fair amount about my Mom this past year of blogs and I loved each post, but the one that not only got the most comments, but also garnered the most readers was the post I wrote after she passed away. This week (yes a couple of days late), this post represents a true closing, the closing of the year 2010. For me, it was a year filled with high highs, and some very low lows. I emerge with a positive outlook and a strong frame of mind, to motor on and continue to try and make a difference in peoples lives. That sounds grandiose, but it is simple I think. Wake up, try hard to be a good person, help others and make an impact on those around you and when the chips are down, in the end YOU will be the better for it. Thank you for letting me take part in the year that was 2010, but I look forward to a better 2011. In the last week of school last semester, in talking with a colleague about the past semester, I talked about that it was not my best, and that in true web fashion, I will start the next semester and year with a simple approach. I am releasing a new software version. Not that the old version was not working well, and not like the new one will not have it’s share of issues, but the new Jim 3.0 promises to be the best one yet. Also, thanks to the girls for supporting me, making me laugh and above all for loving me for being who I am and especially thanks to my wife, best friend and blog editor, Nathalie for being the half that makes me whole.